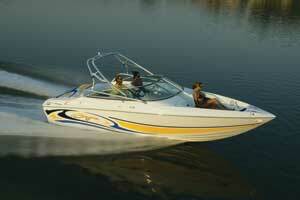 Award-winning runabout boasts sport boat looks and performance. Topping our list of things we liked about the 277 Islander's performance—and the performance of Baja's models in general—was its handling. 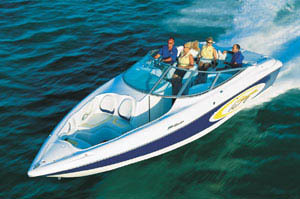 From the side, you'd never know the new-for-2007 Islander from Baja Marine is a bow rider. That's by design, of course. Even the smallest model in the Islander line, a 19-footer, boasts sport-boat styling. 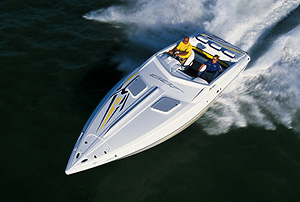 The Islander series gives runabout buyers who see themselves in something with more-aggressive styling several worthy options. 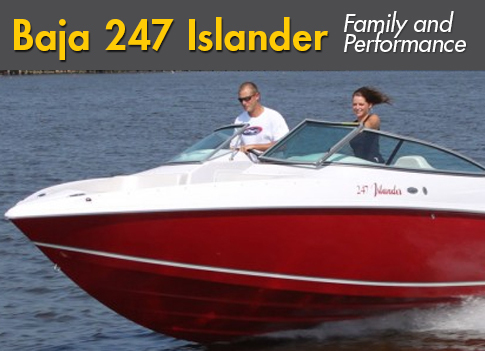 The 277 Islander actually fills a slot—that of a large stylish runabout—that was created when the builder discontinued the 272 several years ago. 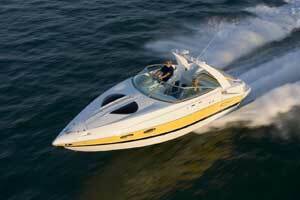 Buyer trends are cyclical and larger runabouts have made a comeback. With the 277 Islander, which, in addition to dock appeal, offers beyond-runabout performance and clever features, Baja seems to have nailed it. Our inspector boarded the 277 Islander via the center walk-through in the sun pad, which converted to a tanning bed with a filler cushion. Two permanent cushions on each side of the walk-through opened on gas struts for access to large stowage lockers. The immediately noticeable feature in the cockpit was its W-shape rear bench. An inspired option, the bench, which also had a center walk-through, was configured so that the outside passengers faced slightly toward one another to make conversation easier. The unique seat enhanced intimacy without compromising space. To better use the area, the bench was set up to accommodate two coolers beneath it. Plus, as one inspector said, "It just looks so different—and so cool." No coincidence, the builder finished the boat's sole with diamond-plate-style nonskid. The geometry of the nonskid matched the angles of the bench. Even the ample gunwale pads had complementary angles. 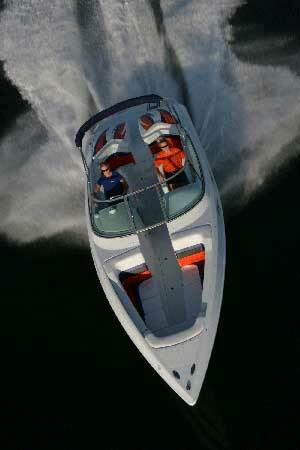 Contributing to the 277 Islander's "sport boat not runabout" feel was a pair of bolsters with manual dropout bottoms. In the console ahead of the co-pilot's bolster on the port side was a head locker with a portable head, headliner and courtesy light. To starboard was the helm, and it was laid out with a tilt steering wheel surrounded by Livorsi Marine II instruments in simulated carbon-fiber panels and a privately labeled throttle and shifter. We have no problem with Livorsi II instruments, which is Livorsi's least-expensive line, but with all the space at the dash the builder might consider bigger gauges. Sure, they'd add to the price, but they'd be easier to read—and the dash wouldn't seem so empty. Other instruments included a compass and a depthsounder. Rocker switches activated the accessories. In addition to the lockers under the sun pad, there were stowage compartments in the driver's console and in the sole of the walk-through. Like the rear bench, the two forward-facing bow lounges had an ingenious configuration. The center section of each bottom cushion was hinged and could be set in place to create a lounge with contoured leg support. That made sitting forward, knees up, a breeze. 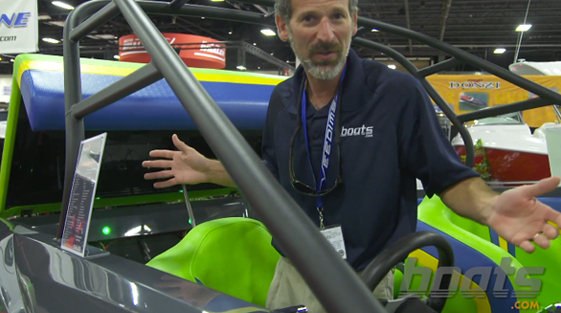 Baja is a production builder—on that point there is no debate. But considering the volume of boats the company produces each year, and the reasonable (this being the performance-boat world) prices at which they're offered, its construction quality is a strong point. Take the hullsides of the 277 Islander. They were straight and clean—we've seen lesser work on custom boats that commanded far higher prices. The bow rider's gelcoat colors of black, orange and blue were vibrant. Only the Baja logo was applied in vinyl tape, and, like the vinyl rubrail with a stainless-steel insert, its installation was handled cleanly. Vinylester resin and biaxial fiberglass were used in the vacuum-infused hull, which was cored with end-grain balsa in select areas. Hardware included a telescoping ladder in a locker on the swim platform, six retractable cleats, a solid walk-through windshield and stainless-steel grab handles. Twin screw jacks raised the engine hatch. In a move we applaud, Baja went the performance-boat route with the installation of a MerCruiser 496 Mag HO engine in the 277 Islander. The big-block was mounted with painted aluminum L-angles through-bolted to the stringers. Wires were organized in a conduit-protected loom and supported with cushion clamps. The entire installation was neat and simple. Topping our list of things we liked about the 277 Islander's performance—and the performance of Baja's models in general—was its handling. Riding on a conventional deep-V hull, six strakes and a delta pad, the boat was delightfully connected and consistent in turns. In the most abrupt maneuvers, it did not slip or catch. Bottom line: The 277 was a joy to drive. 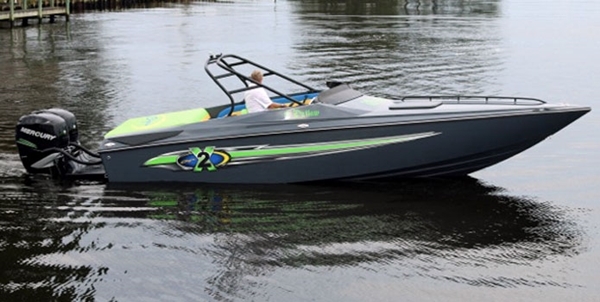 With its 425-horsepower engine running 4,750 rpm, the boat topped out at 61.5 mph, which is a very reasonable top speed for a family oriented bow rider, regardless of its sporty appearance. The boat is offered with up to a 600-hp engine from Mercury Racing, and while that certainly would be interesting, we thought the supplied power was ideal for the boat. Time to plane with the trim tabs down was 4.4 seconds and the boat hit 47 mph in 15 seconds from a standing start. Running from 20 to 40 mph took 7.1 seconds. Like the top speed, these numbers reflected appropriate performance for the breed. In the rougher water on Sarasota Bay, the 277 Islander did have a few rattles. But on the plus side, its ride was soft. Baja didn't resurrect and stretch the old 272 Islander to create the 277. The builder started with a clean sheet, as evidenced by the W-shape bench and convertible bow lounges. At the same time, the builder retained the best attributes, most notably great handling and plenty of features from past and present Baja offerings. And all of it comes in a model that's priced less than $100,000.